Growing up in the rural eastern Manitoba town of Se. Anne, located some 40 minutes southeast of Winnipeg and 10 minutes north on Highway 12 from Steinbach, three year Canadian Sport School Hockey League and St. Mary’s Academy female prep student athlete Kate Gregoire has always had ice on her mind as far back as she can remember. “My dad flooded our backyard rink and my home is very close to our local rink (Ste. Anne Arena) so hockey and skating has been in my blood since my earliest memories,” Gregoire recalls fondly. What was to develop later in life was a second athletic passion beyond hockey and one that has become both complimentary for her but also now extra rewarding. The game of golf, first introduced to her by her dad, has developed since her earliest days at her longtime home course of Quarry Oaks in nearby Steinbach to the point where she is among the elite female golfers in the Province. Today, the grade 12 student is completing her final year at St. Mary’s Academy as a prep team assistant captain, second in team scoring and also was recently named as one of seven returning players on the roster for the U18 Female Team Manitoba, who will now go on to participate in the 2019 Canada Winter Games in Red Deer, Alberta February 24 – March 2, 2019. In addition, she has helped lead the school to three straight provincial golf championships and is the 2016 Manitoba Games Bronze Medalist - Golf (individual) and 2017 Golf Manitoba U-16 Female Champion. Gregoire’s successes on the ice and on the greens did not go unnoticed by her closest major university and, after several discussions with 2017-18 National Champion Bison Head Coach Jon Rempel, reigning USports Coach of the Year, and his current interim Head Coach, Sean Fisher, as well as with Bri-Ann Tokariwski, a 2010 St. Mary’s Academy graduate herself and Head Coach of the Lady Bisons Golf team, a unique joint hockey-golf scholarship offer was made. In spite of numerous other offers and feelers from other schools both south and north of the 49th parallel, it did not take long at all for Kate to accept the offer. Being able to continue to cross-develop and grow her skills in both hockey and golf in her own backyard, in complimentary areas including hand-eye co-ordination, upper core strength and focus, Gregoire credits her second “love” – golf, with having had a huge and positive impact on her first, hockey! 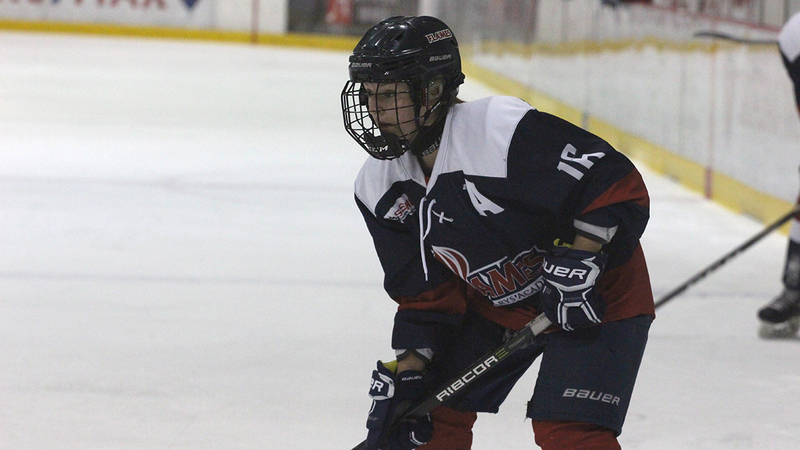 Sean Fisher is equally impressed with the 5’4 forward, who can play center or wing and has developed a strong 200-foot game in addition to her soft hands and breakaway speed. "Kate is a dynamic skater and is able to generate offense out of seemingly nothing," said Fisher. "She makes players around her better and will be a driving force of Bison offensive hockey in future years. Looking back over the past three years at St. Mary’s Academy, Gregoire credits her parents, Phil and Barb, her family and friends, her teachers, coaches, especially Head Coach Larry “Bummer” Bumstead for his organized and innovative approach to the game, and team mates for her growth in both activities. © 2019, CANADIAN SPORT SCHOOL HOCKEY LEAGUE. ALL RIGHTS RESERVED.